Hardcover, 250 pp., 27 pls. 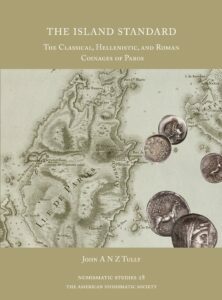 This book is the first comprehensive study of the monetary history of one of the major coin-producing states of the Hellenistic and Roman Aegean. It analyzes the Classical, Hellenistic, and Roman coinages of the Cycladic island of Paros. It presents a die study of all known silver and bronze issues, and argues that Paros and its neighbor Naxos minted in the Hellenistic Period not on the Rhodian standard as has sometimes been thought, but on their own distinct standard: the “island standard”. All coin types are fully described, and die varieties are illustrated in 27 plates. John Tully read Greats at Magdalen College, Oxford before moving to Harvard, then Princeton, where he finished his PhD dissertation on “Networks, Hegemony, and Multipolarity in the Hellenistic Cyclades” in 2012. In 2010, he took the Eric P. Newman Graduate Seminar in Numismatics at the ANS in New York; this book is a direct result of the project he started there. He is currently a consultant in New York.